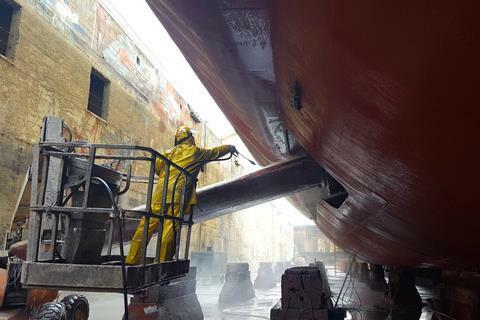 Ten years ago, the International Maritime Organisation (IMO) placed a global ban on the use of tributyltin (TBT) in antifouling systems and put an end to what once was among the most important chemicals in the shipping industry. TBT – a group of compounds that consist of between one and four organic components attached to a tin atom via carbon–tin covalent bonds – used to do its job well. It was highly effective at warding off barnacles, shells and other marine creatures, which have the habit of settling onto boat hulls. When sea life smother their hulls, the boats slow down and use more fuel, so people have long hunted for ways to keep tenacious little hitchhikers off their boats. But leaching out from antifouling paints into the marine environment, TBT turned out to be highly toxic toward non-target organisms. The resulting ban on the substance forced the antifouling industry to make a U-turn. It became highly reliant on copper, a veteran in protecting boats. As early as the 18th century, hulls were covered in a thin layer of the compound where, in reaction with seawater, it would form copper oxychloride that deters marine creatures from getting a grip. Now, most antifouling products consist of copper metal oxides in combination with other co-biocides, such as zinc pyrithione or the polymer zineb. But like TBT before it, copper is falling out of favour. Its widespread use in commercial shipping and on leisure boats means worryingly large amounts of copper are leaching from coatings and stoking environmental concerns. In a study released last year, RIVM warned that antifouling coatings are a significant source of emissions of toxic substances.1 A few months before, Germany’s environment agency (UBA) had found that antifouling paints on recreational boats alone pollute German waters with about 70 tonnes of copper per year.2 Alarmed by what this could do to bacteria, algae and fish in the marine ecosystem, the UBA asked boat owners to hand clean boats of algae and other unwanted growth rather than rely on biocidal paint. For now, copper-based coatings are still clinging to boat hulls around the globe. Only the state of Washington in the US has ruled that it will phase out the use of copper-based paint for recreational boats by 2021 due to toxic impacts on juvenile salmon. But voices against the metal’s use in boat paints are getting louder. California’s department of pesticide regulation has established a maximum leach rate for copper-based antifouling products, which became effective on 1 July 2018. And the European Commission has been pushing member states and industry to work harder on finding alternatives to copper and invest in substitution. But the road to replacing copper is a bumpy one. RIVM’s study points to some alternatives to copper-based paints that it deems safer, such as ‘hard’ foul release coatings, films with fibres, ultrasound systems and simply storing boats out of the water. But Wezenbeek says consumers of antifouling systems are conservative and ‘generally stick to the system they know and that works’. In addition, we know little about how effective and environmentally friendly these alternatives really are. Those that do not contain any biocides can enter the market without the rigorous testing required under the EU law that deals with biocidal antifoulings, the biocidal products regulation (BPR). The Dutch government wants to tackle part of this problem by setting up a performance testing programme that will compare the different non-biocidal and non-self-polishing antifouling systems, according to Wezenbeek. She adds that the programme could form the basis of a standardised efficacy test for antifouling systems. Such a test could help convince consumers that there are effective alternatives to copper, Wezenbeek hopes. There are various reasons for this lack of enthusiasm toward alternatives, according to Fielding. Some are too expensive, others are difficult to apply or only work effectively under certain conditions. Hard coatings, for instance, require a greater degree of maintenance and more time spent on cleaning boats. ‘That’s not to say that with some further development [these alternatives] will not improve and may take up a greater share of the market. But it’s not as if you could just flick a switch and take out biocide-based antifouling technologies and replace them with biocide-free ones,’ Fielding says. At the same time, the copper quandary is fuelling innovation. Industry is working hard to generate non-metallic antifouling technologies that can keep up with copper in efficacy and practicability. AkzoNobel, for instance, is throwing its weight behind ultraviolet light-emitting diodes (UV-LED). Integrated in protective coatings, they emit UV light to prevent biofouling on the surface of the boat or vessel. The chemical giant expects to bring a first-generation commercial product based on this technology to the market in 2023. One of Asia’s largest coatings manufacturers, Nippon, last year launched antifouling technology based around the anti-thrombogenic polymers used to construct artificial hearts and blood vessels in the medical sector. The medical polymeric material is designed so that no organisms can stick to the surface, with the aim to prevent blood clots. Nippon’s coating tackles marine hitchhikers with the same principle. Smaller companies, too, are trying to crack the market with new chemistries. Janssen PMP has introduced a product – Econea – based on an arylpyrrole compound, tralopyril, instead of metals. It breaks down quickly and can match copper at keeping hard fouling marine organisms at bay, according to the company. Swedish SME iTech has entered the market with medetomidine (trade name Selektope), an organic compound that fights off barnacles by temporarily stimulating their cyprid larvae’s octopamine receptor. This keeps the larvae in swimming mode and unable to attach to the hull. Another approach to antifouling came through the EU-funded low emission antifouling (Leaf) project. A three-year-long collaboration involving research bodies, coatings producers and maritime associations, Leaf tackled whether biocidal paints could work by way of a different active substance release mechanism, to better their environmental health profile. Leaf resulted in a prototype paint which, instead of releasing biocides into the water, releases its effect on direct contact with the fouling organism. The biocidal effect takes place inside the paint, rather than at its outermost layer, therefore causing low emissions of chemicals into the environment. The project successfully tested this technology with derivatives of avermectin – the molecule, whose discovery was awarded the 2015 Nobel prize in physiology or medicine – as the active substance. But Leaf’s avermectin technology has hit a wall. As a biocide, the researchers need a company to help them carry the compound through the EU’s regulatory system, the BPR. A costly and time-consuming endeavour, Pinori and his team are struggling to find somebody willing to take it on. The BPR is both a cause and a barrier in the copper substitution saga. BCF expects the law will lead to some chemicals used in antifouling paints to disappear from the EU market, and that this could make it harder to tackle invasive species. Some companies decided against applying for BPR approval, because they weren’t able to justify the cost involved, says Fielding. Others were too unsure whether their substance or product would make it through the regulation’s stringent risk assessment. Meanwhile, some commonly used co-biocides may not be available for much longer. Zinc pyrithione, for one, is due to be classified as reprotoxic 1B under the classification, labelling and packaging (CLP) Regulation. This would trigger a ban under the BPR and put an end to its use in antifouling paints, where it is currently used to bring down levels of copper in formulations. ‘We have a problem then, because what do we do, go back to increasing our copper levels? If we do that then the products are going to fail their risk assessments [under the BPR],’ says Fielding. For now, Fielding says, the antifouling industry is in a ‘balanced situation’. But, he warns, ‘we are heading into a very tight corner in terms of the number of active substances remaining and in terms of those substances that do remain facing concentration limits well below the levels at which they are useful.’ The BCF worries that this situation is increasing the risks to the environment and human health. ‘Think of the marine environment like a major train station, followed by a set of bus stops. You have the commercial vessels bringing in invasive species into ports and harbours and from there they reach the marinas and, without adequate protection on leisure boats and yachts, they end up being taken to different parts of the UK and European coastlines,’ Fielding says. Whether, then, copper will still be part of the solution – or the problem – is yet to be seen. A very nice review of the recent problems in Antifouling paint market regarding copper's effect on the ecosystem. However, I wonder some points in the paper regarding UV-LED technology. Although main task is to remove fouling organisms from the ships' hull, special care should be taken for fouling organisms. Actually, the fouling process is a "natural" process. Therefore, the anti-fouling processes should be natural. Have you ever seen a shark whom emits UV light to remove fouling organisms from its skin? We should mimic the nature, I believe. Although I do not have the detail of the work of Akzo-Nobel, I know that UV-light can be very dangerous for fouling organisms. The green formulas should be prioritised in R&D studies. Btw, I strongly agree with what Wezenberg said regarding behaviour of the consumers: "consumers of antifouling systems are conservative and generally stick to the system they know and that works". The consumers of the antifouling paints should know that 70 million tons of copper-based biocides, 6 million tons of booster biocides, and 20 million liters of solvent are released into oceans and also atmosphere per year, respectively (1-2). This is not sustainable process and I am not happy with the releasing very stable compounds such as copper, zinc etc in the oceans. The consumers and also readers should also know that the development of a new antifouling agents are so costly. As it has been mentioned in the paper, I found the estimated costs regarding development of an antifouling agents from the published papers (2,3) are “toxicity studies on active substances, 1−3 M€; environmental studies and ecotoxicity, 0.6−4 M€; formulation studies, 1 M€; risk assessments/exposure scenarios expertise needed, 1 M€; dossier preparation, 0.1−0.25 M€; registration fees, 0.1−0.2 M€; task forces, 0.05−0.2 M€”. In conclusion, we should focus on green antifouling strategies by mimicking the natural strategies occurring in marine organism for the saving the oceans. However, our civilization [in terms of chemistry] is remarkably far from the amazing chemistry of the marine living organisms’ antifouling strategies based on more than million years’ experience in the field of antifouling. 1. Lejars, M.; Margaillan, A.; Bressy, C. Chemical reviews, 2012, 112(8), 4347-4390.